Synopsis: The third and final instalment of Christopher Nolan’s Dark Knight Trilogy. Set eight years after the events of The Dark Knight, Batman has been declared public enemy number 1 by Gotham City. Meanwhile Bruce Wayne has become a social recluse. However, he is forced to return as the Batman and protect Gotham City as a new threat emerges in the form of the ruthless mercenary Bane who seeks to render Gotham City to ashes. Review: The thrilling conclusion to the trilogy that firmly put the Batman franchise back on the map of superhero films. At the end of the preceding chapter, we saw how the peace that was established in Gotham was based on a lie, the lie of Harvey Dent. In the introduction of the film, after an enthralling plane heist scene, it shows in great depth that the actions of the Joker have had a deep and lasting impact on the people of Gotham as the people are still dealing with the aftermath of the destruction that was unleashed on the people of Gotham. While they are still on the recovery path, the fearless Bane, played by Tom Hardy, arrives in the city to carry out what the Joker did not, destroy Gotham. One of the main people that the Joker really left his mark on is Batman himself as we see how much he has just completely withdrawn into his shell in the years since. He lost a lot of physical strength in the eight years in between the two films and it sets the scene perfectly for the arrival of Bane as he is in his prime physical condition. As with previous two chapters of this trilogy, the story of this film is really engrossing. Initially the citizens of Gotham are living on this false sense that peace had been achieved and that all the crime and corruption in Gotham had been eradicated with the Joker’s capture. Yet, Bane takes his chance with both hands to blow this façade apart and he does this ruthlessly and takes out anyone who dares to stand in his way. Hardy is magnificent in this role and in my opinion is the best villain of the trilogy. He has the intellect of the Joker, but a considerable physical advantage that made him a formidable opponent to Batman. His voice, although hard to understand at times, is another factor that makes him a frightening force to be reckoned with. As the majority of his face is covered by his mask, he has to use his eyes to convey his emotion and he does this brilliantly. The film’s action goes up another gear from the previous film as Bane threatens to torture the citizens of Gotham and completely tear the city apart, and it is up to a weakened Batman to come to Gotham’s rescue once more. This film boasts the best action scenes of the entire trilogy. All of the returning cast again shine in their roles. Special mention must go to Michael Caine who arguably delivers his best performance of the trilogy. The new members of the cast also deliver great performances. Anne Hathaway and Marion Cotillard both deliver wonderful female performances as Selina Kyle (AKA Catwoman) and Miranda Tate respectively. Hathaway was seductive and brilliantly cunning at the same time, and she excelled as Catwoman. Similarly, Cotillard was equally strong in her leading role as the very intelligent businesswoman Miranda Tate. Joseph Gordon-Levitt also gives a strong performance as the smart and determined policeman John Blake. The Dark Knight Rises was the film we deserved and the one that we needed to wrap up this magnificent trilogy. Every member of the cast, as with the first two films, played their roles out to absolute perfection. 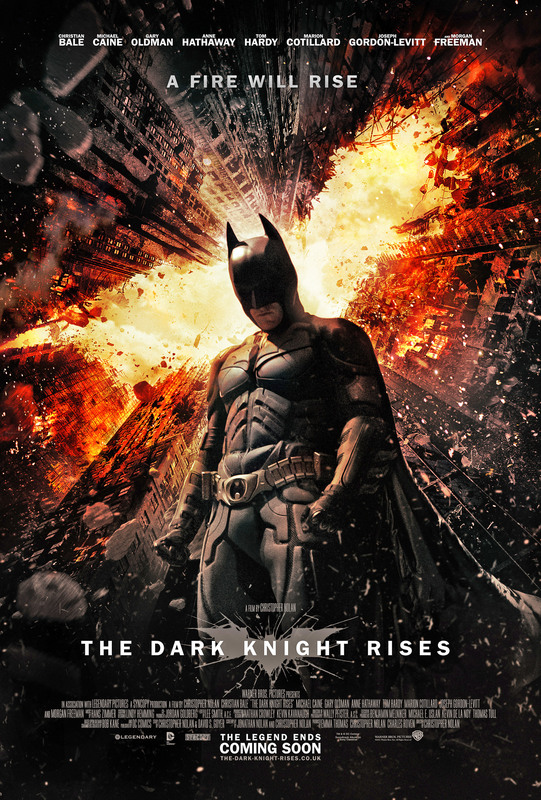 The action scenes are again pulsating to watch and with superb acting by everyone involved, along with the perfect villain, The Dark Knight Rises was one of the best films of 2012 and is the best film of Nolan’s Dark Knight Trilogy in my opinion. In a year that produced some extraordinary films and performances, The Dark Knight Rises was a little unlucky not to pick up at least one Oscar nomination. However it remains one of 2012’s best films. I take my hat off to Christopher Nolan for giving us three individual masterpieces that combine to form one of the best film trilogies of the 21st century. The third chapter in a trilogy, and one that this time closes the trilogy in just about a perfect way with an emotional story, more great action and an absolutely brilliant villain in Bane.